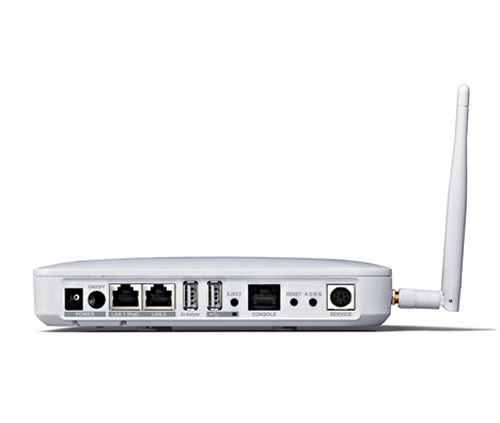 Buffalo's AirStation Pro 802.11n Gigabit Concurrent Dual Band PoE Wireless Access Point provides high performance 802.11n speeds and coverage, with simultaneous operation on two concurrent bands for greater networking flexibility. 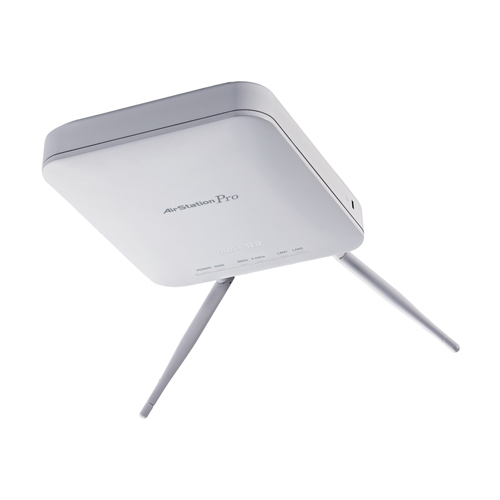 Featuring integrated Power over Ethernet (PoE), AirStation Pro 802.11n AP offers easy installation and placement, even on high ceilings, drop ceilings, walls and other locations where power may not be available. Its plenum-rated chassis and multiple mounting options provide greater flexibility in installation locations, enabling users to safely install the unit above ceiling tiles. Additionally, multiple SSID support with VLAN tagging offers easy network segmentation and added security. Concurrent dual band technology creates two separate Wireless-N networks at the same time—one on the 2.4 GHz frequency and the other on the less congested 5 GHz frequency. Assign high bandwidth clients to the uncongested 5 GHz frequency and low bandwidth clients to the more common 2.4 GHz frequency. Integrated Power over Ethernet (PoE) allows the device to be powered without an AC power source for easy installation and placement, even on high ceilings, drop ceilings, walls and other locations where power may not be available. By using a PoE switch, users can install the AP anywhere they can run an Ethernet cable. AirStation Pro 802.11n AP allows administrators to create multiple SSIDs with different security passphrases for easy network segmentation and added security. Network administrators can assign each SSID a VLAN tag to specify what network access that SSID gets. Wireless Distribution System (WDS) allows users to easily extend coverage of their wireless network by interconnection multiple access points. 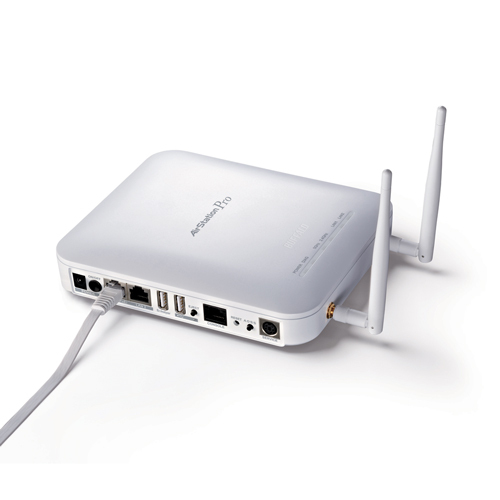 Easily bridge a WLAN spanning multiple buildings or expand coverage in a home to hard to reach locations. Easily add high gain antennas for longer range, wireless bridging or backhaul solutions. 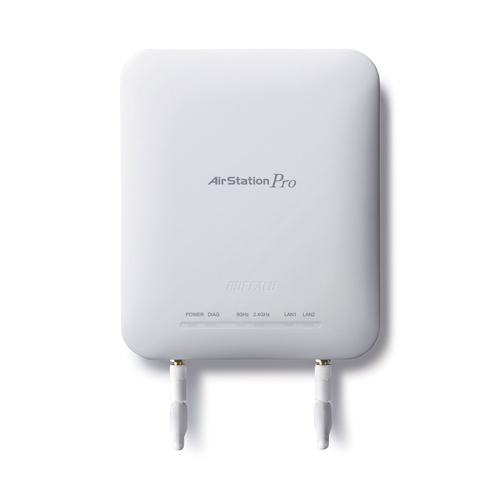 AirStation Pro 802.11n AP uses industry-standard RP-SMA connectors, compatible with readily available third party solutions. 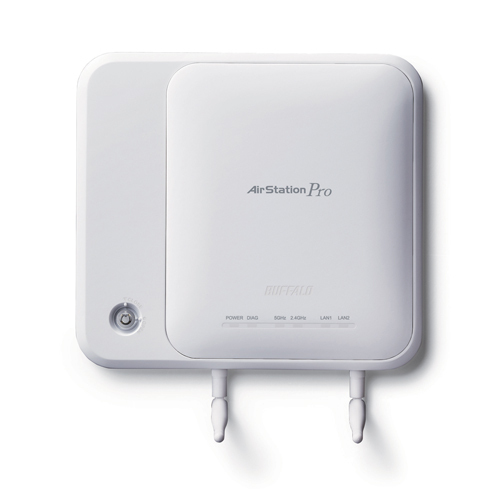 AirStation Pro 802.11n AP oers easy installation and placement, even on high ceilings, drop ceilings, walls and other locations where power may not be available. Its plenum-rated chassis and multiple mounting options provide greater flexibility in installation locations, enabling users to safely install the unit above ceiling tiles. 802.1X RADIUS authentication provides enterprise-grade access restrictions, helping to keep unauthorized users out. By moving authentication to a backend RADIUS server*, only specified and authorized wireless devices are permitted to connect to the wireless network. 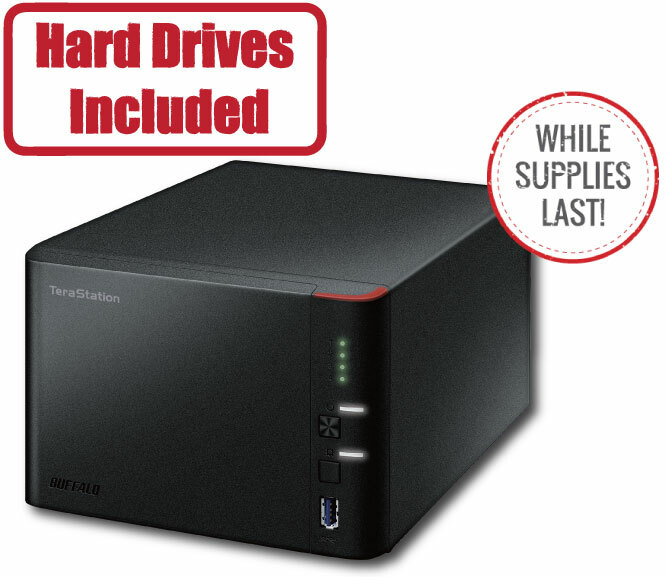 *WAPS-APG600H does not have an internal RADIUS server, it supports passing authentication to external RADIUS authentication servers.